Food producers from across County Durham are being given a direct route to take their products to market. Durham Food Hub, which is operating under the Food Durham Trading Limited (FDTL) company name, has been created as part of plans to champion small, independent retailers in County Durham. The aim is to support as many local small regional producers as possible but to help build up systems and processes eight selected food producers who are already making sought after goods but have struggled to get their products onto broader distribution are being supported. These include a specialist ice cream dessert company, cheese makers and an artisan bakery. Durham Food Hub, which is being spearheaded by the man behind the Phileas Fogg snack company, Keith Gill, and Dr Liz Charles, has been building up a platform of support since the start of 2017 and is now ready to launch fully. Durham Community Action, the charity which is managing the Durham Food Hub, has been supporting the local community since 1935 in the areas of social welfare, promoting health, supporting volunteer groups and enabling enterprises. They have been working with the Durham Food Partnership, a volunteer group of broad interests and enterprises to encourage healthy, sustainable local food systems since 2014. Food Durham Trading has been created as the implementation vehicle and was officially launched at an event at Durham Town Hall. Gill said: “Consumers have been aware of where the food we eat comes from and have been interested in sourcing products that are made closer to home for some years now. “However, main issue for local producers has been limited distribution as well as, in some cases, making their products fit for different sales channels. “In County Durham we are fortunate that there are so many wonderful food producers who, with a bit of help, could see their goods selling on the open market not just here in the county but nationally too. “What we’ll do is work with them to assess where they are in the business journey, from conception to consumption, to develop their individual plans including which sales channels and distribution are the best for them and then determine what support they need to get their products out into the public arena. “Sales channels and distribution are key elements for success so we have completed a contractual arrangement for distribution with J.R.Holland which has enabled us to tap into their customer base as well as other existing channels. Food from Durham does not have a high profile, like some other regions, however the food market in County Durham is growing, with around 100 small producers of food and 1,000 outlets where food products are sold, including retailers, independent shops, restaurants and accommodation outlets. Food sales also make a significant contribution to County Durham’s economy, with around 38% of the £800m economic value coming via this route. Statistics also show that for every £10 spent on locally made products £25 is put back into the local economy. As part of Durham Food Hub’s aim to create a thriving market for sustainable, healthy and tasty food producers to sell their products, the team is also working in partnership with Visit County Durham to create a ‘Taste Durham Welcome Pack’ – one of their new sales channel. The pack is being distributed to accommodation facilities across County Durham and will include 12 specially selected food products made by food producers in the county. Michelle Gorman, managing director of Visit County Durham, said: “Food and drink are strong drivers for visitors when selecting where they wish to spend their time and these novel welcome packs will help forge a much stronger link with food from Durham by introducing guests to a selection of unique local produce. Another company that is being supported by Durham Food Hub is ice cream manufacturer Archers. Archers already supplies its ice creams and ice cream cakes in their three ice cream parlours and is now developing a range of products which it hopes to sell in selected supermarkets in the luxury dessert category. Owner Sue Archer said: “As part of our range for the parlours we developed a large cake made not from sponge but layers of ice cream. These are beautifully decorated with fruit, colis, nuts, chocolate twirls and other items to complete the ‘look’. “They taste just as good as our other ranges but, working with Food Durham and Keith, we have prepared individual portions in new packaging suitable for a broader number of retail and food service businesses. Keith added: “There are other food hubs around the country but we are advised that we are the only one which has adopted an approach of building sales and distribution channels first. 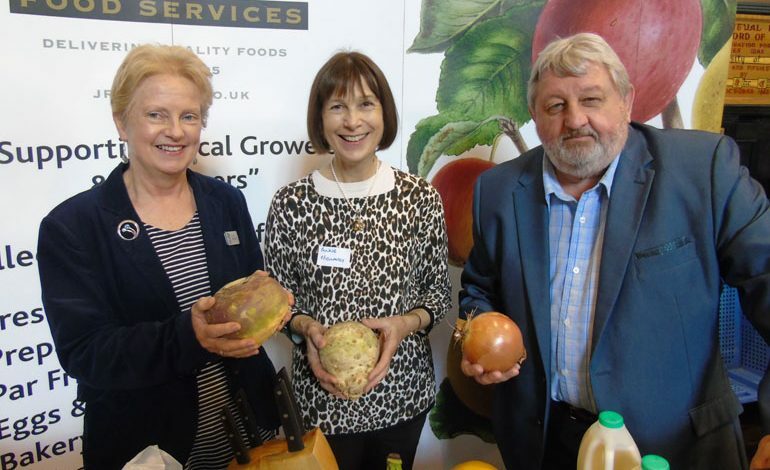 • Pictured (above): Dr Liz Charles, left, with Anne Mellanby from Mellanby’s, a fruit and vegetable supplier from Hutton Henry, and Keith Gill, manager of the new Durham Food Hub.